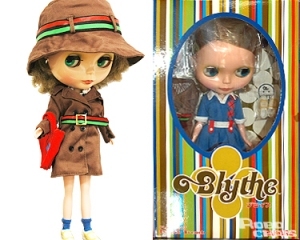 The first time I saw a Blythe doll was on VH1's I Love the 70s and they completely freaked me out. With their abnormally large heads and ability to change the color of their eyes with the pull of a string (blue, green, pink and orange) I thought, "That is the scariest and ugliest thing I've ever seen!" My tune has changed since, but more on that later. Blythe dolls were originally produced by Kenner (now owned by Hasbro) and made their debut in 1972. But with poor sales, the big-headed darlings were quickly pulled off the shelves after just one year of being in production. In 1997, photographer Gina Garan was introduced to Blythe from a friend saying she looked like the doll. With an old camera she had been given, she began taking photos of Blythe dolls and brought them with her everywhere she went. In 2000, Chronicle Books published a compilation of her photos in This is Blythe. 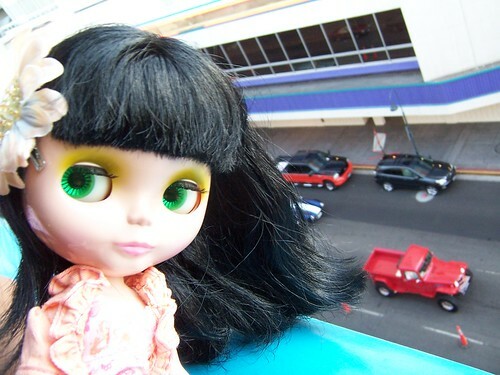 Somewhere in between all that, Blythe dolls began to gain popularity in Japan. 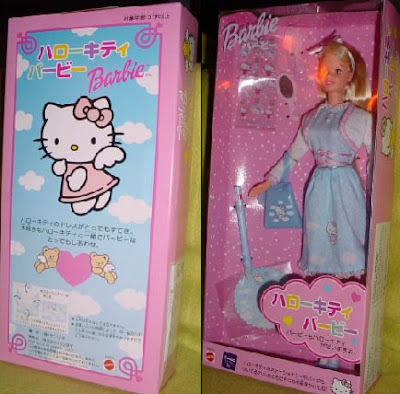 In 2001, the first of the neo-Blythes (newer, up-dated dolls) were produced by Takara. And on eBay, original Blythe dolls jumped in price from $35 to $350. 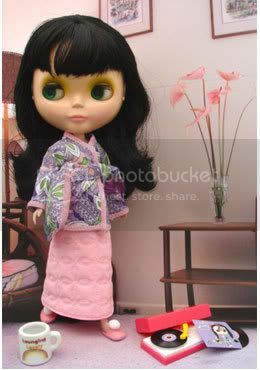 But nowadays, you'd be lucky to find an original Blythe for just $350 -- now they can be found for over $1000!!! Yikes! For a more thorough history, check out Gina's site. Ok, now fast-forwarding to present day. 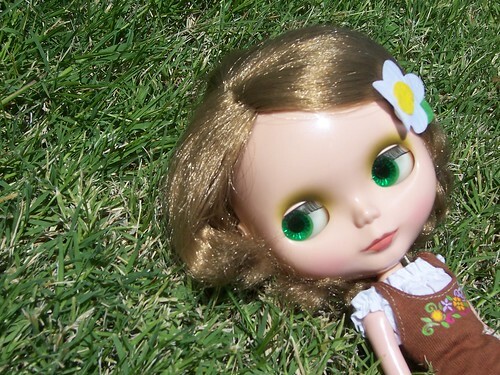 Blythe dolls are still ever so popular and have even reached an underground cult status. People take their dolls out and about and snap their own pictures of them, make dollhouses out of bookshelves, and customize their dolls like crazy. Just go on Flickr and type in Blythe -- you'll see! I discovered my friend Jean had a fascination with Blythes and has one of her own (actually, she now has 4). The two of us planned a little photo session with her Blythe, a French Trench named Sylvie, and some of my toys (vinyl figures + Uglydoll). Sylvie freaked me out at first, but by the end of our amateur photo spree, I became very intrigued and did some research. And then I said, "I must have one!!!" 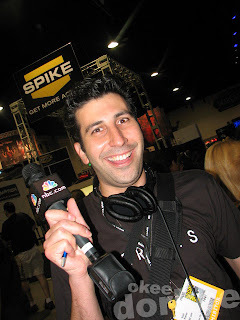 Looking at all the photos on Flickr made me want to get in touch with my inner Brian McCarthy. I happened upon one Blythe model, the Lounging Lovely. With her black hair and retro pink & purple pajamas, I knew that was the one. Plus she was like a mini-me :) Jean knew I was itching for my own Blythe so she generously lent Sylvie to me -- I had her for almost a month. 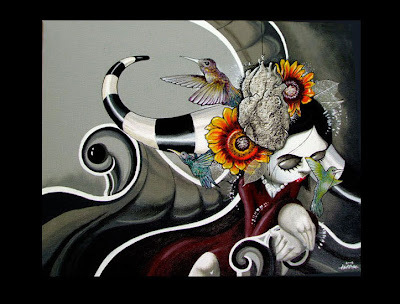 Oil by Sket-One is being the first release from Red Magic's Love Original Series in conjunction with Sket-One's solo art show in NY "Night & Day". The black-flocked vinyl figure is so exclusive and rare that it is limited to only 150 pieces (80 available in North America) and is only available at My Plastic Heart. Make sure you scoop this vinyl treasure up before its gone! 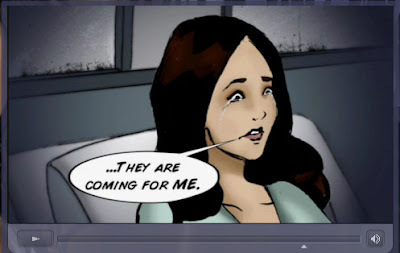 The Ghost Whisperer will be coming out with animated shorts this fall season which will coincide with the television series. 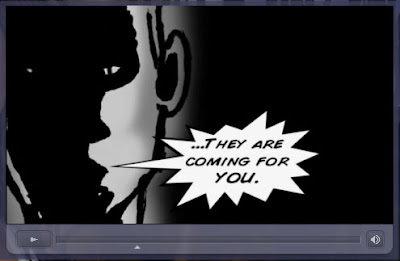 See more of the Ghost Whisperer Animated Teaser here. i wanna know, "howdya do that???" The freakin' ball got it right! I did it a couple of times, and golly, it got it right over and over again! Another big collabo is coming our way! 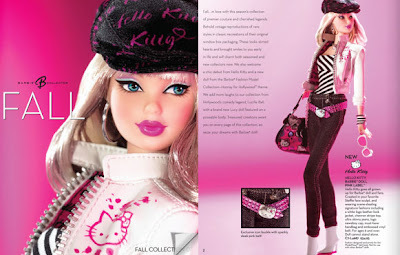 The Hello Kitty® Barbie® Doll is set to hit stores on September 14. It will be a pink label barbie, which means it does not have a "run" limit and should be found at most retailers, premiere destination to be at Walmart. 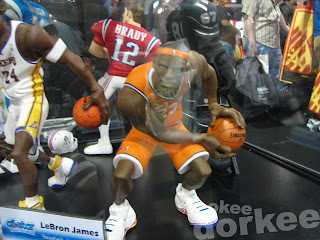 Also, it can be purchased on barbiecollector.com. Golly, yet another thing to watch out for! 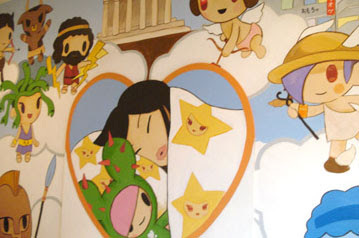 I also can't wait for the Tokidoki & Hello Kitty Collabo too! 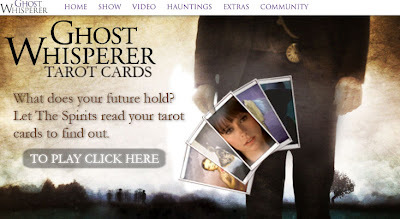 Have you checked out The Ghost Whisperer page yet? It's time to bust out your sketchbooks, sharpies, colored pencils, Adobe Illustrator and Wacom Pads because you have the chance to design a tour t-shirt for The Donnas' upcoming fall tour for their new album Bitchin'. First things first: in order to participate in the contest, you have to become a member at iMeem and then join The Donnas group page. After that, you're free to let your creativity run amuk with visions of their new album Bitchin' and fall tour to fill your head with inspiration -- 'cause that's what the design is supposed to be themed on. The winning design will be chosen based on ratings, comments, and a panel of judges. The winner will receive two tickets and backstage passes to the Dallas, Texas show (10.16.07) and accommodations for two at hotel near the arena. Woo-hoo! Ain't that bitchin'? <-- I had to! Deadline is October 1. For more details on the contest, go here. Bitchin' drops on September 18. Anyhoo, what is really cool about The Ghost Whisperer is it is more than just a show. Their website alone is entertaining. There are tons of stuff to check out on their site. 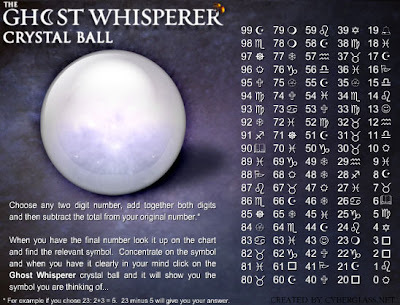 Like, ask a real ghost whisperer questions, tarot card reading and look into a crystal ball where your fate can be told. The tarot card reading and crystal ball feature will also be a bonus feature in their upcoming Second Season DVD due out on September 18. So I built up the courage to roam their site (so what if i have my computer on mute? Hey, you want a story, right? ha, gotta do what i gotta do to get things done) and played the Tarot Card feature, and golly (juli) gie willikers, chills...chills i say (even on a hot cali day.) My fortune was all too true. "The Winged Woman hovers, wings fully extended. They keep her aloft, yet her clothes tether her. Recognize things in your life that hold you back. Then cut loose = Free Yourself!" 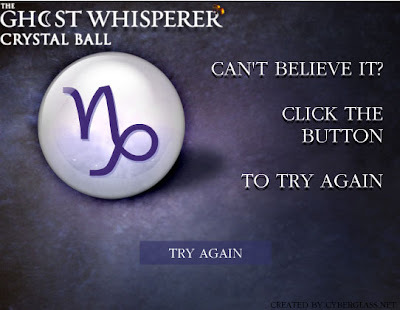 Try it out and let me know how your Tarot Card Reading goes. Forget about horoscopes telling you you like a lot of attention because you're a Pisces or that you're materialistic because you're a Capricorn (harumph!) . Instead, let your regular Starbucks drink determine your personality via The Oracle of Starbucks. Just type in your full drink order, including the size [tall, grande, venti], and voila! Instant personality analyzed by your usual Starbucks order. You don't go to Starbucks much; when you do you just tag along with other people since you have nothing better to do. You would like to order a Tazo Chai Crème but don't know how to pronounce it. Most people who drink tall caramel frappucino are strippers. I got the same result for my winter usual -- Tall White Chocolate Mocha. So is it accurate, you're wondering? Well let's put it this way, I can be found at the mall when class is cancelled -- that's about it. No pole dancing for me! Whatever, it's fun. Go try it and tell us what your drink says about you! *Note: The Oracle of Starbucks isn't affiliated with the Starbucks company. "Killer Tune((キラーチューン)", the latest single to be released off of Tokyo Jihen's upcoming album Variety, will be released on August 22nd. I picked up Tokyo Jihen's other recent single release "OSCA" and I have to say that they definitely stepped it up since their last album release two years ago. The difficulty to label or place Tokyo Jihen into any one genre is about 10 stars in Street Fighter II...possibly harder since you'll fail anyway. This is one of the reasons why I was attracted to Shiina Ringo and later Tokyo Jihen in the first place. Shiina Ringo is such a trip and so eccentric in a way that she leaves me wanting more (what a tease she is). I swear, if I can find a girl with the same swagger and steez as Ringo I will be one happy man. Currently taking applications. HA! Make your order for the single or pre-order Variety here. Special hello to "anonymous." You know which one you are. BLAHAHAHAHAHA! Didya catch Sunday's Extreme Makeover Home Edition? After three years of waiting since their last album More Adventurous, Rilo Kiley is back! Their fourth album, and major label debut, Under the Blacklight drops on Tuesday, August 21. When I first heard the album's first single, "The Moneymaker", I have to say I was confused on whether I liked it or not. Sure the hook was catchy and it made my head bob, but it just didn't sound like the Rilo Kiley I was so used to -- folky, kinda rockish, and serene-like. Some fans might even call them sellouts, but not I! I almost feel like this album should've been called More Adventurous because they've experimented with electro beats, soul-singin' back up vocalists, and even have a few uptempo numbers -- there's even one with some Spanish ("Dejalo")! The two tracks I like most are "Silver Lining" and "Breakin' Up". That'll probably change once I listen to it more. 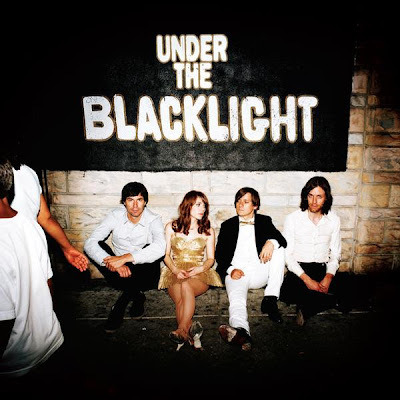 If you haven't heard of Rilo Kiley before (where've ya been? ), I suggest you check out their first 3 albums: Take Offs and Landings, The Execution of All Things, and the aforementioned More Adventurous. Dear Earthling, you're so Schmancy. I recently came fresh from a long roadtrip from Seattle, Washington. 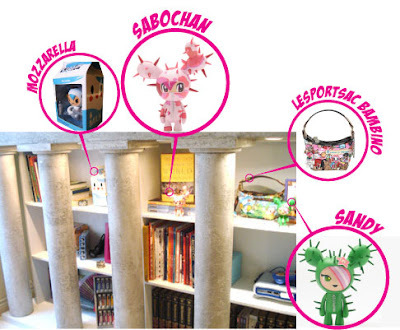 Besides a very beautiful city with an even bigger heart, I also discovered this great little designer toy store/gallery in the heart of downtown called Schmancy Toys. For those residing in the Seattle, your fellow Seattlite artist, Dear Earthling, will be having a show tonight from 6:00 pm to 9:00 pm at the awesome toy store and gallery Schmancy. 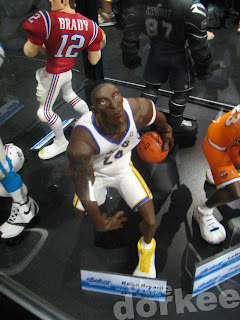 There will be plenty of his work for sale as well as plenty of great designer toys for sale. Find out more about Dear Earthling at his site or befriend him at his myspace. For those not residing at the wondeful (not a typo) city of rain, coffee, and grunge, I'll be posting a full review of Schmancy as well as the trilogy of awesome that are its complimentary stores *Fancy * Schmancy * Pants* ;) very soon! Another popular zip code is here officially here today! 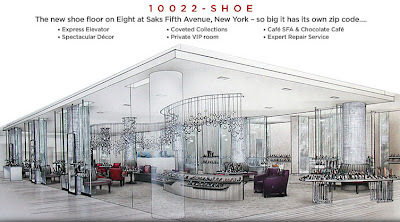 The Saks Fifth Ave in New York has a new shoe section that's SO BIG that it has its own zip code! uh, when can i move in??? Ribbon cutting ceremony happened today at 9:30am with stylist to the stars, Mr. Philip Bloch (such a doll!). 10222-Shoe officially opened its doors today at 11:00am. "10222-Shoe" will have its own express elevator, private vip rooms, and its own cafe. my, my my! For the longest time I've been needing to get a USB flash drive, but kept holding out because I really, really wanted a Mimobot (by Mimoco). It's like a functional doo-dad that could also double as a toy -- what's not to love about that? They even have a little story: they're from the Planet Blooh located in galaxy 4210 . . . you can check that out here. At 2", they come in an array of designs by contemporary artists and have even teamed up with some pretty awesome franchises like Gloomy Bears, Star Wars (remember our past post about them?) and most recently Happy Tree Friends. You can get these little dudes in capacities of 512 MG, 1 GB, 2 GB and 4 GB. And depending on which design you get, they're produced in limited editions of 250 - 3,500 units. See, they're collectibles and compatible with both Macs and PCs. Prices range from $39.95 - $109.95. I finally got one when I went to Comic Con -- the 2 GB Gigglebyte. 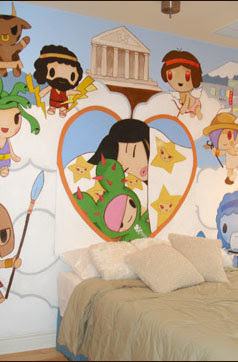 Originally I was going to get the Fairybit, but I guess the saleswoman thought I was pointing at something else . . . oh well. I got the last 2 GB Gigglebyte so HA! And with my purchase I got a free Vimobot. Vimobots are 4" vinyl toys and are blind-boxed. The designs they have out right now are of the Mimobots from the first core series. It's also available in plain white for your DIY pleasure, plus its also a contest! Take a picture of your DIY creation and submit it to Mimoco. People will get to vote on designs and the ones that win will get to see their Vimobot turned into an actual Mimobot! Round one is done . . . bring on two! Executive producers, Kim Moses and Ian Sander, Web dude, Justin Fisher, and miss star actress, Jennifer Love Hewitt gathered with us press peeps to discuss the cool new stuff to expect from The Ghost Whisperer at the Comic Con this year. People, people! It's not just a tv show anymore. You too can take part in the haunting storyline with Melinda. Fans have a chance to dig deeper into the story. We are encourage to head online and experience the journey inside the underworld and see for ourselves what goes on at The Other Side. The Other Side is a spin-off of The Ghost Whisperer and is an all new Web-based series that shows you the world through the eyes of ghosts. 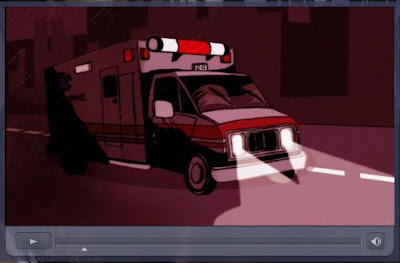 There are webisodes that only viewers can see online! And who knows, your favorite webisode character might be seen on The Ghost Whisperer. I'm actually still on their site as I type this. Not looking at the clock, but listening to the rad music and eating a sandwich. I feel fat. You gotta be! It's summertime and since the new school year is approaching, get rid of your old books. Well, sell them so you can buy new books so you can buy new digs for school. See, it's a win-win for everyone! The Paul Frank Stores nationwide are launching their first annual book drive between August 13 and 31. Head over to your local Paul Frank Store and bring in a new book for children aged 3 to 6 years old and receive 20% off your purchase. The Paul Frank Stores will be donating to First Book, a nonprofit organization that provides children in low-income families the opportunity to read and own their first new books. 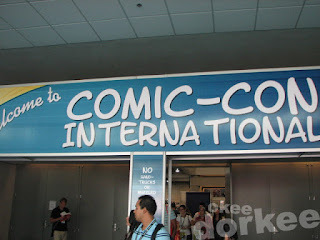 We STILL have tons of Comic Con coverage to tell ya about! So, Didya see us at the Freebee Table? ...stay tuned...as we said, we still have tons of Comic Con news we haven't gotten to yet. Exclusive news from her will be revealed this week!!! Vote for Miss Jennifer Love Hewitt for Best Actress for this year's Teen Choice Awards. I came across this in a bulletin on myspace. 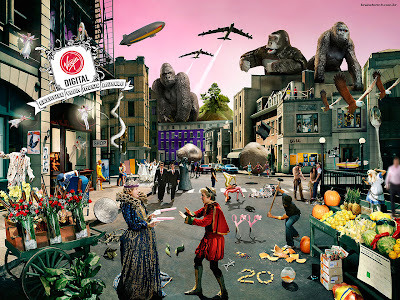 Virgin Digital had a contest to name as many bands hidden within the following picture. The contest is long since over but that doesn't mean it's lost its fun! Let's see how many we can get. Tell us your finds in the Comments section! Remember back in my Hasbro post I said there would be more info on the R2-KT figure that I bought? I know its been awhile, but I finally did it! 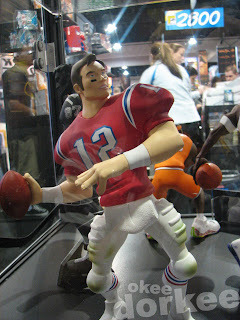 The figure was a limited edition run available only at the Con and on the Hasbro and Star Wars online websites. All proceeds from the sales of the R2-KT figure went to the Make-A-Wish Foundation. R2-KT was originally made for a little girl named Katie Johnson who was diagnosed with a brain tumor. Albin Johnson, her father and founder of the 501st Legion, thought of the idea of creating an R2 unit to watch over Katie much like R2-D2 watched over Padme in Episode II. Katie's sister pitched in the idea to make Katie's R2 unit pink and to name it R2-KT (like R2-Katie.) You can read more about how the Johnson's idea came to fruition on the R2-KT Home Page and more about Katie on her home page. Though Katie's battle with cancer ended in August of 2005, R2-KT's mission is "to entertain children, raise awareness of pediatric cancer, and raise money for such charities as Make-A-Wish and Children's Cancer Fund" (from R2-KT Home Page.) Though Hasbro's stock of R2-KT figures sold out at the Con and their online website shortly thereafter, I recently checked their webpage to find that they did get a few more in stock. At only $9.99 a pop, its not a bad way of giving to a good cause. I've been hankering for some good Indian food for quite some time now so I was super excited that my aunts wanted to take me out for dinner at Khana Peena when I visited them this past Monday. Khana Peena is this great restaurant that serves Northern Indian cuisine in three East Bay locations: Solano Ave and Oxfort St (both in Berkeley) and on Rockridge in Oakland. If you're in the area, I highly recommend it. We happened to go to the Solano Ave location. This was my second time around at Khana Peena and it was just as delicious as the first time I went last year. We started off with vegetable samosas and papadum (a kind of thin lentil wafer/chip). Food is served family style and we had about 6 different main dishes to choose from. The Tandoori Mint Chicken was surprisingly yummy even though it was a bright shade of St. Patrick's Day green. I also enjoyed the Aloo Gobi which was a potato and cauliflower concoction and my favorite from the first time was the Lamb Vindaloo. Of course, everything should be eaten with their most delicious Naan (Indian style bread... kinda tortilla like). They offer their Naan in a myriad of flavors, but I find the plain Naan to be exceptionally awesome for dipping into the sauces of the various dishes. My favorite sauce was probably the one that went with this vegetable dumpling dish. I'm sorry I can't remember the name of the dish itself, but believe me... it was scrumptious. The Chicken Korma was probably my second favorite dish of the night. BTW - their Cold Chai is yumm-o! Man, this post is making me hungry! Khana Peena may be a bit pricey for my college student budget, but they do have an all-you-can-eat lunch buffet for around $9 so I may have to come back again for that. The service there was excellent and feel free to ask your server for recommendations if you're having trouble narrowing down your options. So if you're in the neighborhood and craving something spicy and full of flavor, Khana Peena is the place to go! Just check out their site for the full menu! But you don't have to take my word for it! After a few days of resting and trying to get back to reality, I finally have a chance to post my recap on this year's Con 2007. On the 27th, I had to take a midterm before I floored the pedal from Pomona back down to San Diego. Such bad timing. It was hard to keep focused cause I was so anxious to get to the comic mecca. Don't worry, though... I aced the test. I hit downtown a little before 4pm and did my usual routine of parking at Horton Plaza and walking the 3 or so blocks to the convention center. I heard the crowd was massive earlier during the day, but it didn't seem so bad when I got there. After picking up badges, I headed into the exhibit hall. It seemed like I was just there a day ago. The hall seemed the same as it was a year earlier. Not to mention the occasional smell of cumin in the air. Never mind. That smell was body odor. Not mine, though. I shower everyday. Sometimes twice. Enough jibba jabba. You want pictures, I know. I think the first booth I checked out was the super-deformed miniature sized version of Issac's art studio. 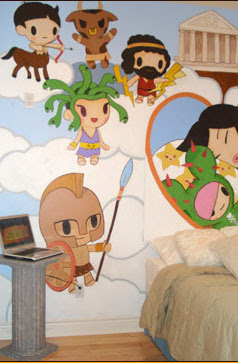 A.K.A the Heroes booth. 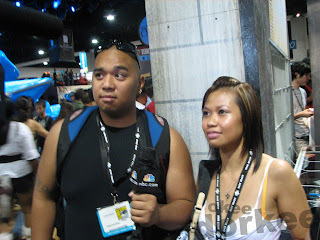 This camera guy from NBC wanted to get some interviews from some fans about their favorite character and episode of the show. This guy's favorite character? Horned Rimmed Glasses (but he said it all cool as "H-R-G"). His favorite episode? Company Man. How I remember this? I don't know. I didn't wanna get on camera, so the homies Adrian and Liz did it instead. 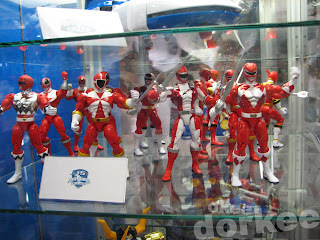 These power rangers are a bunch of bloodz... Yeah, just like that. With a "z" at the end. 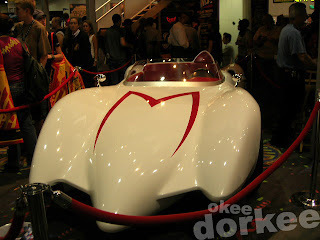 Mach 5. Pretty cool, but not enough leg room for me and Trixie. 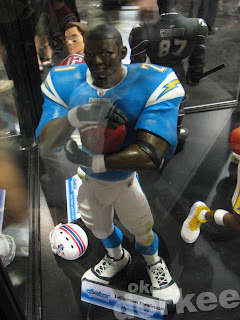 LaDainian Tomlinson. A must cop. Some eastside SD cats... bears... whatever, that wanted to be on the blog. Here you go. 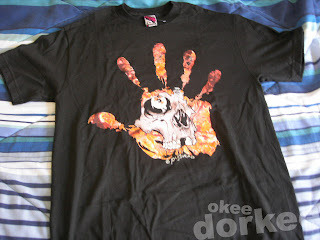 A Pushead tee from Super7. A Linda Tran. Just kidding. Don't let her pretty face and curvaceous body fool you. She's a hustler forreal. 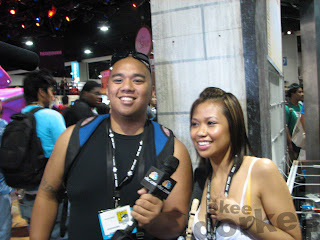 She even some how managed to sneak her card into my press badge. What in the world?! The San Diego Race Queen Rei Ayanami Con 2007 exclusive as reported by JanuS SainT. Still in the box. I also picked up one of those all white Chukanucka's from Ugly Doll for my niece, but I didn't get a chance to get a picture of it. For some reason all the Ugly Dolls at their booth were all white. Throughout the 4 days, I was on the search for Yamato's Max Jenius VF-1A. I wasn't able to find one where the price was right. Or maybe I wasn't looking hard enough. I blame Linda for distracting me. Next year I'll find it and it will be mine. 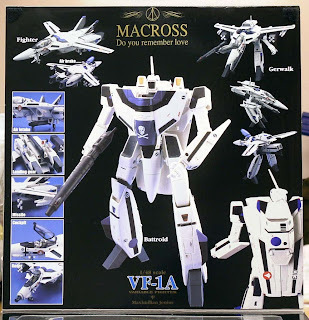 Murse1 needs to post up the stealth VF-1J he picked up for a steal. That thing is dope. Like I said, another year, another Comic-Con. I'll come better prepared next year and hopefully no midterms fall around July 24, 2007. Anyway... that's it. Time to hit the books again. Yeah, right. I'm gonna watch the eastcoast feed of Saved by the Bell. LATERS DUDES! 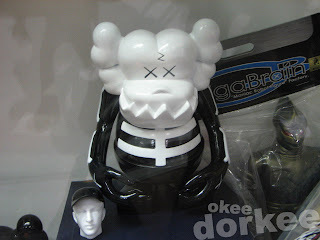 Art, fashion, vinyl toys, music and everything in between.